The Custom Stable has been meticulously designed to be the model of efficiency. In a busy clinic we know it can be difficult to wade through an enormous fitting set or a complicated fitting guide. The Custom Stable Prime, Elite, and Aurora are available in diameter 14.8-17.8 to solve all of your custom contact lens fitting needs. 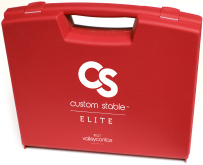 We are proud to say that the Custom Stable Elite 15.8 has revolutionized scleral lens fitting everywhere. This concept for the 15.8 Custom Stable Elite began with our desire to build a lens that fit every patient perfectly. We challenge you to convert the Flat K of your patient to Sagittal Depth. You may think it can’t be done. You may say it’s not that easy, or that it won’t work at all. That is why we offer you this challenge. Your first pair is on us, so take The Custom Stable Challenge and with our full money back guarantee if you prove us wrong you won’t lose a thing. The Custom Stable family of lenses are the best lens for every eye. Visit our website and check out our specially developed Custom Stable training video. We give you a front row seat to see how easy it is to convert Flat K to Sagittal Depth. Did you catch all that? Pass our short quiz and you are on your way. Buy a fully refundable 12 lens 15.8/16.8 Custom Stable Elite fitting set. You have really come through this time! Not only are you more knowledgable about our process, but you will receive one of our highly prized First Pair Free vouchers! We are very excited to invite you to take The Custom Stable Challenge. We also value your insight and your hands on experience. If you haven’t taken our challenge yet, please do and prove us right or wrong.